Two weeks ago my grad school friends and I met for the opening weekend release of Beauty and the Beast. There was a lot of excitement surrounding the meet up, as these teacher friends and I usually only get together during school holidays and breaks (#teacherlife). There was also, simply, a lot of excitement surrounding the release of the movie. 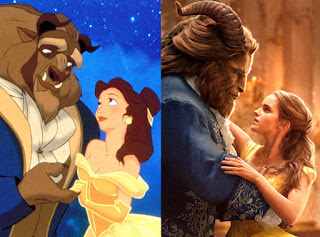 After all, it's been 26 years since Disney released the animated version of Beauty and the Beast. I'm not 100% sure why....perhaps it was because I saw the movie with fellow teachers (and our sons), or the fact that it's been such a long time since the original, or a combination of the two, but I started thinking about how Beauty and the Beast is a tale of how we as educators need to re-invent our teaching and re-release it for a new audience. Some would say there is nothing wrong with the original 1991 version of Beauty and the Beast. The animation was perfect. The scenery was perfect. The music was perfect. The supporting characters were perfect. Belle was perfect. The movie was perfect! How could it be improved? How do you improve perfection? I know teachers who feel this way about their teaching. They ask, "Why do I need this new... (fill in the blank), my kids have always learned with my methods. They do well on the state test." I will never forget when a young teacher in her third year announced to me, "I am so happy to finally be teaching the same grade...now I can just look back at my lesson plans and copy/paste!" WHAT??? Hold on!!! Pump the breaks!!! You are a third year teacher and already you have lost the excitement of lesson creating? (I call it lesson creating, because, let's be honest, there is nothing exciting about lesson planning.) This teacher was too young and too new in her chosen career to be so excited about reaching into the digital filing cabinet and using old and dated lesson plans. We cannot simply take lessons out of the vault and change the date on them! Don't get me wrong, all lessons do not need to be re-created from scratch. From year to year our standards and curriculum do not change much. Sometimes we can take an already strong framework and breathe new life into the lesson. Change the delivery method. See if there is a good place for the use of technology. Add student choice. Change the mentor text. Create new story-problem sets that include your students' names and interests. Flip a lesson. There are so many ways to rejuvenate a our teaching practices. We need to keep in mind that each year our students change. Their interest change. Technologies change. And every now and again, our curriculum and standards will change (Next Gen Science Standards, anyone?). Change can be good. Change keeps us fresh. Change keeps us on our toes. Change keeps the moths out of the wardrobe. Create something new from the old. We need change, not for the sake of change, but because our kids deserve it! Again, you hit it out of the park, my friend. This metaphor is so on point it's scary. Definitely sharing with colleagues! Oh my gosh, thank you so much for your kind and generous words! Schools really need to consider teachers as real human beings and give them practical work loads instead of continuously piling so much stuff on them.